When taking a patient history how often do you hear ‘I’ve been told I have a scoliosis’? I hear it a lot! I’d say most of the time (maybe 90%) there is no scoliosis. However, a recent patient had a true structural scoliosis, not too bad, but still…had to get my head in scoliosis mode for the first time in a while. Though it was pretty easy to help her symptoms in the short term, I was quite excited about getting her started on some strategies to help in the medium to long term. Part of the reason for thinking this is because she had a history of seeing other therapists quite regularly. I’d like to see if she can manage better with some good quality strategies. This kind of case has been made a lot easier since seeing a lecture on it by Dr David Tiberio. Also, the bones move, joints feel, muscles react thought process we developed at FASTER. So, today we will look at how to understand what is going on in a scoliosis and the best strategies to help. Scoliosis is generally thought of as a lateral curve in the spine. However, because of our understanding of Fryette’s laws we know that segment motion is coupled. So, instead of thinking purely of the lateral deviation, think of the rotation too. Fryette’s laws I’ll cover in more detail another time, but for now all we need to know is that when the there is lateral flexion in one direction there will be rotation in the opposite direction. 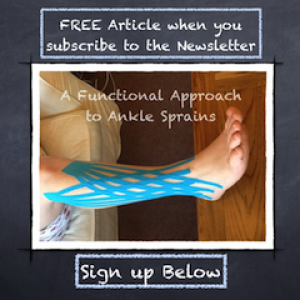 For example, if the lateral flexion is to the left, the rotation will be to the right. It’s best to think of the bone motions rather than joint motions. The normal strategies around ‘correcting’ the lateral curve miss the point of the rotation. From what I can see when you laterally flex the spine back towards ‘neutral’ or midline the rotation doesn’t follow suit and me even drive further into it’s rotation. So how do we deal with the rotation as well? Clearly, this needs something that deals with both the frontal and transverse plane positions. If the primary curve is in the lumbar spine I’ll use the pelvis, if the primary curve is in the thoracic I’ll use arm positions/drivers. The simple strategy here is to raise a foot onto a step, the height depending on the severity of the curve. You can then ‘adjust’ the rotational component with the range of your forward stride length. In the above example with a left lateral flexion curve with right rotation I would put the right foot on the step. This will tilt the pelvis left, flexing the lumbar spine to the right. It will also rotate the pelvis to the left, rotating the lumbar vertebrae to the left. I start with a standard step and then see how it looks and how the patient feels…and adjust up/down accordingly. To adjust the rotation you move the back foot forward/back to change the stride length. Once you are happy with the position, I suggest driving some motion through the spine, easiest is some rotation with hand drivers, or maybe some lateral flexion with hand drivers. Though writing this out it seems extremely simple, it’s the understanding that is the key. Establish what curves you need to work with and then position accordingly. Once in position, drive motion.